The Llandaff Clergy School is in Oxford this week, and I took a trip into town to see if I could catch a few folk whilst they were there. It was lovely to see Peter, still working on building projects at St Catherine's; Irving, whose wisdom helped me through some difficult days in my first curacy; Chris, who was once a neighbour; Roger, who used to live in one of my parishes. Archbishop Barry gave a moving address at the recent Church in Wales Governing Body, speaking of the impact of his wife's death at the start of the year. It was typically honest of him, and filled with faith and yearning, and a very Welsh sense of God and Gospel. I found it beautiful. I was delighted especially therefore to catch both Barry and also Christopher Smith, Archdeacon of Morgannwg. When I was at my lowest, in 2010, broken and ill and needing help, these godly men supported me in all sorts of ways. There were days when I was not charitable toward them at the time - there were days I was not charitable toward anyone at the time - but they went out of their way to help, to give me time, to give me opportunity and to provide for me so that I could begin the road to recovery. I am healthy and thriving in ministry now largely because of them. Barry has been Archbishop of Wales since 2003. When he eventually comes to retire, I hope he is judged kindly. He has certainly not hidden from controversy! But for me, he was always thoughtful, caring, an inspiring preacher and a real friend. And he, and Christopher, along with many others, will always, always have my thanks for all the life-affirming care they gave me. The Gospel reading in our Sunday services this week was the story from John 21 about Jesus and Peter having breakfast on the beach after the Resurrection. Jesus asks Peter if he loves him, and tells him to follow him once more. It's a story I love for all sorts of reasons, but largely because it reminds me of an occasion years ago when I was almost overcome by the struggle of life. It was my second year at theological college. I had to pull out of the degree course and swap to the certificate course because I was unwell and needed less stress. I had been asked to join a mission trip to Jerusalem to work with the two Anglican churches there, and my doctor thought it would do me good. But I still felt like a failure. After the mission week, we got to tour around Galilee and other sites, but still I was grumpy. Everywhere we went, we just got out of the cars, took a photo, got back in the car and drove off. I wanted to take time, to breathe the air Jesus had breathed, to smell the scents, to take it all in. So after we stopped at the Mount of Beatitudes I stomped off in a sulk. I know, can you believe, me in a sulk..? One member of the group came to me and told me it was OK - if I wanted time alone I could have it. Everything was close together on the lake. There was a bus back to Tiberias where we were staying. I'd be fine. "Good," I said, the embodiment of grace. And they left. Taking my lunch with them. So I wandered down through the orange groves to the lakeside and sat on the beach by Tabgha, the site of the breakfast story. I was all alone. It was a grey day, with a mist on the lake, no other tourists anywhere in sight, and I cried out to God. I wanted to serve him, I wanted to be ordained - but I couldn't even succeed in training for ordination. I was failing at everything. And in my misery I felt him whisper in my ear. Find a stone. I paused, bent down, picked up a rock from the beach. He whispered again. See how it looks like an arrow head? So I am sending you. It will be OK.
And I got up, popped the rock in my backpack and walked back up to the road - but time had passed, and the evening was setting in, and I needed to get home. I found the bus stop - and discovered the timetable was entirely in Hebrew. I never quite made Hebrew class at college. For the first time, this caused me some regret. I had no idea if there was a bus, what time it would come, or if I would be standing there till Tuesday week. So I decided to start walking the eight miles back to Tiberias. Maybe I'd thumb a lift? I put my hand out occasionally as cars passed me by. And then one stopped. An old red thing. A Nissan I think. And the driver seemed nice enough. He was, it turned out, a professor at a Hebrew university, a philologist - and he spoke five or six languages. English was number five or six. We chatted in pigeon English and pigeon French, and he asked what I did. I told him I was training to be a priest. And then he said words which completed my day. My week, my year. Words I have never forgotten. Words, the like of which I thought only ever got spoken in the movies. But they were spoken to me. On the beach I had felt like a failure. 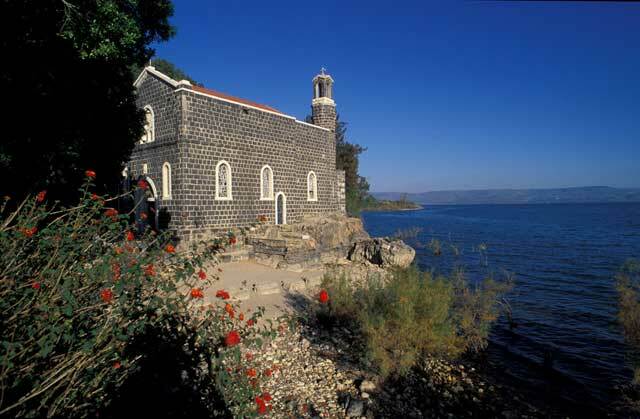 By the time we got to Tiberias I felt ten feet tall. No longer was God whispering in my ear. He was driving me home. "If you want God's want, you are - how you say - Congratulations."